Some of the symptoms of dry eye include a burning sensation or gritty feeling in the eyes. 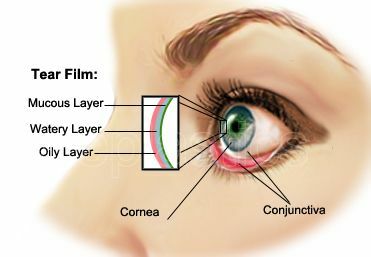 You might possibly also experience decreased tolerance to contact lens wear or sensitivity to light. Many different things can cause dry eye syndrome. 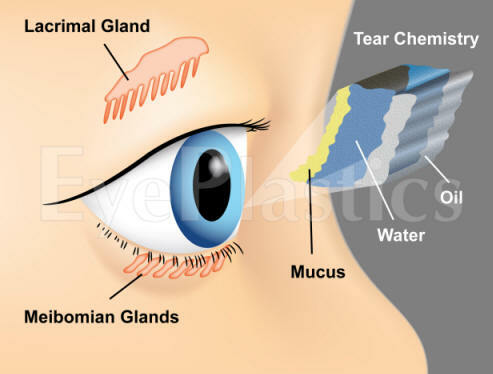 The normal aging of tear glands, as well as specific diseases and disorders, might possibly cause changes in the amount and condition of tears produced. Excessive evaporation of tears can also cause dry eye syndrome. 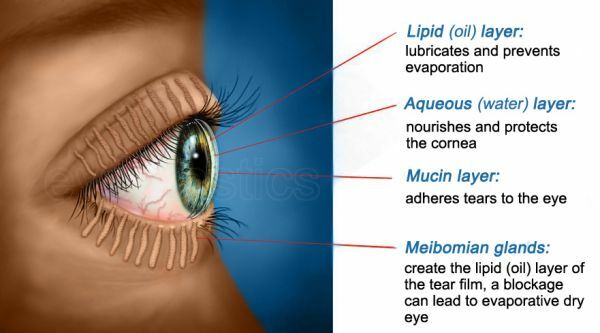 Such evaporation might possibly be caused by "meibomitis," which results from infection and inflammation of the meibomian glands in the eyelids. Patients with thyroid disease (Thyroid or Grave's disease results from overative thyroid which affects the eyes, might possibly cause proptosis, loss of vision and dry eye. Please see the Thryoid page for more details), might possibly also experience dry eye syndrome caused by excessive evaporation.